Regehr Contracting provides demolition and structural removal services that ensure safe and responsible site operation. We have predetermined processes and demolition techniques to remove all grades and classifications of materials including wood, asbestos, steel, concrete and more. Commercial and industrial sites that require demolition prior to re-building present a significant opportunity for both cost-savings and environmental stewardship. Using a newer approach called “deconstruction” prior to demolition can minimize the amount of materials that go to the landfill. This “green” approach is applied by removing the materials by type and segregating them for recycling or reuse. Prior to demolition, Regehr Contracting develops site-specific safety and work plans, obtains the necessary permits and notifications, disconnects utilities and removes hazardous materials, including asbestos abatement, if necessary. Excavators demolish one to two-storey buildings, controlling the manner and direction in which the building falls. For taller buildings, a high reach excavator is used. Fire hoses spray water at varying elevations to control dust and maintain a wet demolition. Hydraulic hammers destabilize concrete structures and concrete processing attachments are used to crush concrete to a manageable size and remove reinforcing steel. Our skid loaders and loaders then take materials out and sort the steel. 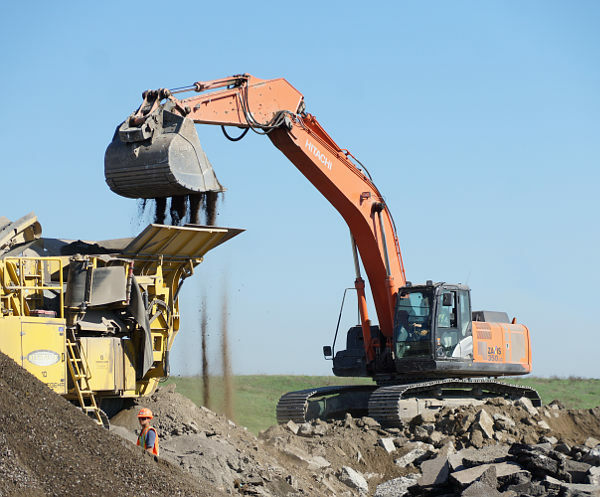 An onsite mobile concrete crusher can process the demolished concrete and asphalt to be reused as type 1 crushed aggregate either as a piling mat for ground stabilization or as aggregate in the mixing of concrete. To ensure the highest safety standards, a site safety officer monitors the demolition project and enforces all safety rules and regulations.